Three Thorsdays in a row...that's just how we roll at DT. But unlike yesterday's 245 and Monday's 1800ES, this one is not a wagon. It is, however, one of the best photographed cars currently on ebay and as such earns the coveted Ansel Adams award (disclaimer: photos on ebay not actually taken by Ansel Adams). The car looks to have been fastidiously rebuilt and maintained over the last few decades by the previous owner and the current seller. It's a 1969 1800S, for sale here on ebay in Portland, Oregon. Bidding is currently hovering around $10k with reserve not met, and about four days to go. This is a perfect example of how photos can make or break a car listing. Instead of grainy, out of focus and overexposed iphone shots we get these beautifully composed, wonderfully lit and finely crafted works of art to stare at. It makes the whole process immensely enjoyable for the prospective buyer. 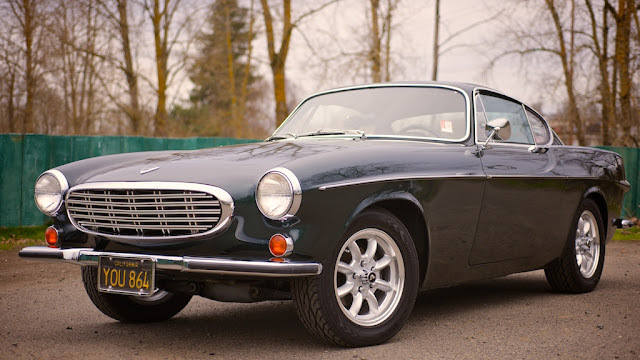 This car is from the last series of 1800S models, after assembly had moved to Sweden and the engine was upgraded to the B20, but before fuel injection and the ugly flow-through cabin vents that later appeared on the rear fenders. 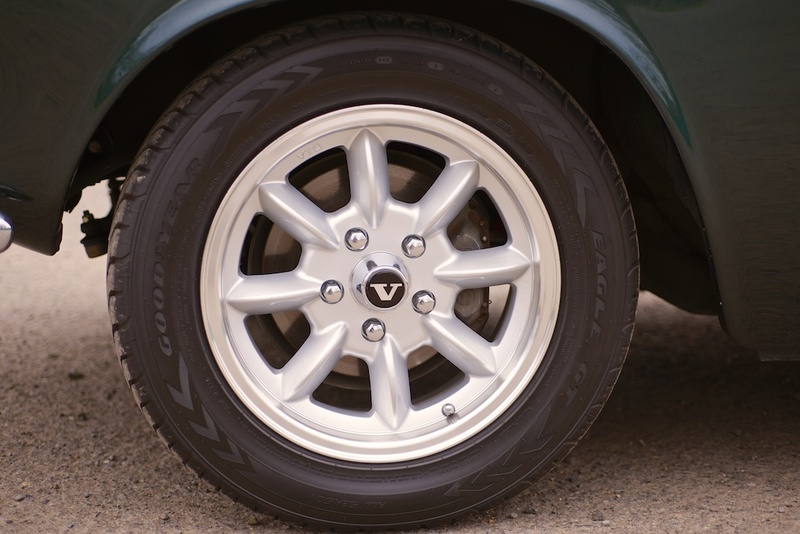 The MiniLite style of wheel is a classic on everything from MGBs to VW Beetles, but the 8-spoked British design looks especially fetching on an 1800 coupe. The creased yet curved shape of the spokes works well with the Pelle Petterson-penned body, which is itself creased, yet also very curvaceous. Another thing we love about this seller's listing is the sheer quantity of photos - we get to see the car at every angle (except from underneath - caveat emptor edit: undercarriage shots are located at the bottom of the auction in the ebay-loaded image area) and in various lighting conditions. Here we can see it's been moved indoors away from the dreary Portland overcast skies. It's obvious under fluorescent lighting that this paint color is not quite period correct. The shade is similar to the original #94 dark green but it has been sprayed in a modern metallic green as the seller explains. We normally only like single stage non-metallic colors on '60s and earlier cars but this one manages to look great in modern paint. The 2.0 liter B20 under the hood has been rebuilt and upgraded with a Weber carburetor, free-flowing air filter, finned aluminum valve cover, modern A/C compressor filled with the good stuff (R12 Freon), and a GM alternator. The upgrades should be good for about 125 hp which will make this car scoot respectably. 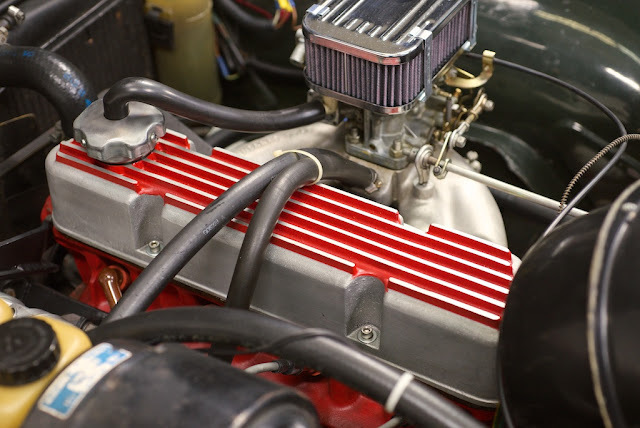 The one thing that looks out of place is that chromed air filter housing - the engine bay would look far better with a period-correct filter, or even just painting the housing to eliminate the bling. 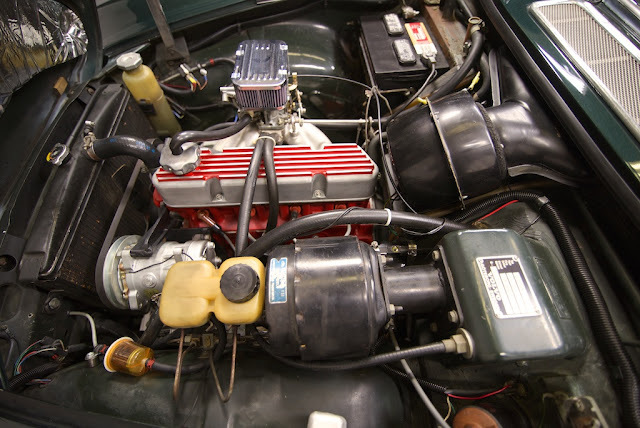 The overall engine bay is very clean and tidy and looks well maintained as a hobby car should. The only problem area we spy is rust forming in the battery tray; this is a common issue for these cars and can be dealt with. We're doing the job ourselves on a '66 1800S currently, using an upgrade/replacement battery tray sourced from iRoll Motors in San Martin, CA. This interior is a classic design and looks amazing in the seller's photos. 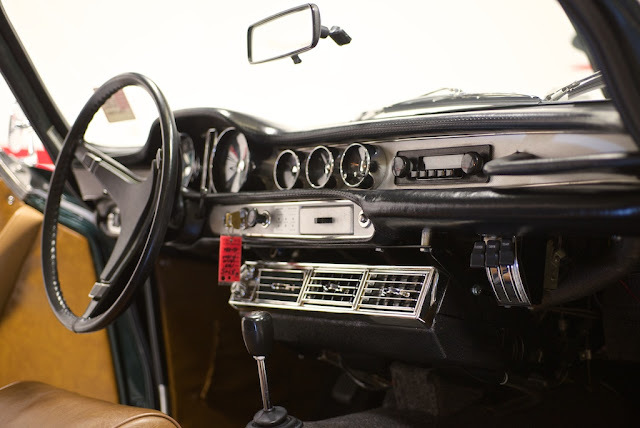 From here we can see the Frigette under-dash air conditioning unit which was likely either a dealer installed option or an aftermarket upgrade. A/C fits the Grand Touring personality of the 1800S well; why not cruise in comfort when outright power isn't the priority? 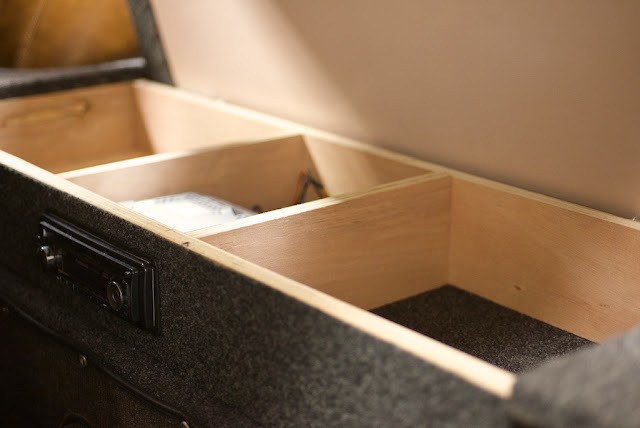 There's been a bit of customization where the vestigial back seat would normally live - instead we see this nicely crafted wood storage box with hinged lid, carpeted exterior, and modern stereo head unit. We like the fact that the original radio is preserved in the dash but question the convenience of a reverse-mounted stereo behind the front seats. 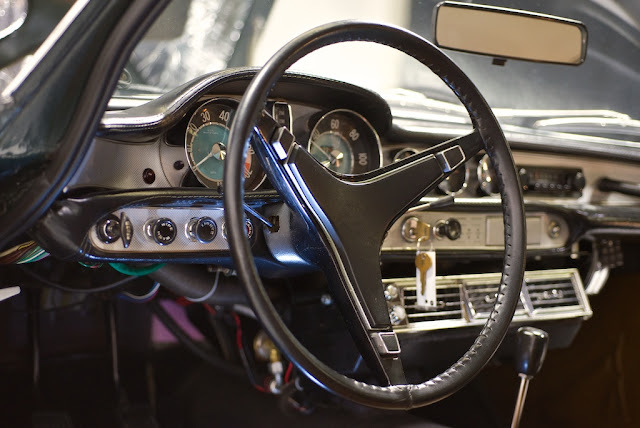 Perhaps the original rearview mirror on the dash could be of assistance when hunting for stations. The upholstery is not original on this one. It's been redone in a sort of butterscotch Naugahyde, which would not be our first choice but seems to be in solid condition. We might be tempted to take this back to a factory color & material sometime down the road if this were our 1800S, but it wouldn't be a high priority. 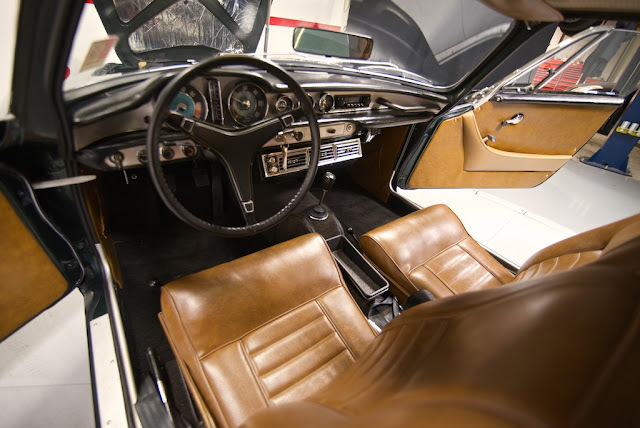 From here we can see the curious mix of styling in the 1969 interior - it still has the turquoise faced gauges that debuted a decade earlier on the P1800 complete with the pressed aluminum accent panels, but got the later plastic 3-spoke steering wheel to replace the holey aluminum 2-spoke earlier piece. The shifter is squarish and plastic too; early 1800s had a turned walnut wood knob. This was a transition year for sure. 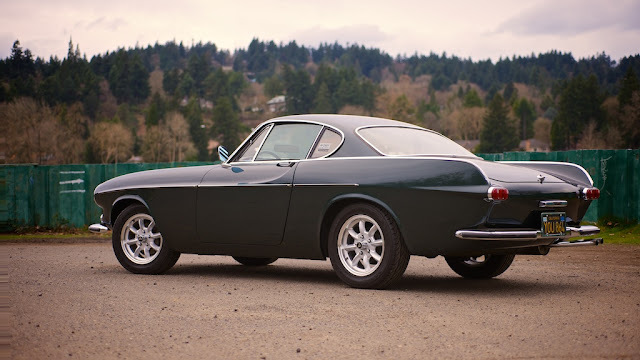 Overall we'd be very happy to own this respectable little Swedish coupe. Even though it is not all original, it has been mildly and tastefully upgraded and should retain most of its value because of that. We'd expect to see a strong ebay sale price given the wealth of fantastic photos provided by the seller, and the fact that this thing looks ready to hit the road immediately. It's the travesty done to the back seat (or, lack of one now) that wrecked this 1800 for me. What is that thing in the back? Mr T's jewelry box? ~ ease up, folks. that's the diversionary contraband faux stash. a place for crooks to overlook other valuables. Yeah, that hope chest is a curious addendum to this restomod. I have heard of custom speaker boxes down there, however, so there you go. Price is a little steep IMHO, given the specific personalization the seller had performed. The overall aesthetic effect of the body is a little too smooth for me, also; but I hate filler of any ilk. YMMV. The turquoise instruments really tickle me, though, as do the deep aluminum gauges; sooooo much better than the panel on my '73... I am not so forgiving about the paint, though. Single stage solids just look so right on the 1800, that the metallic stands out as incongruously blingy to me. 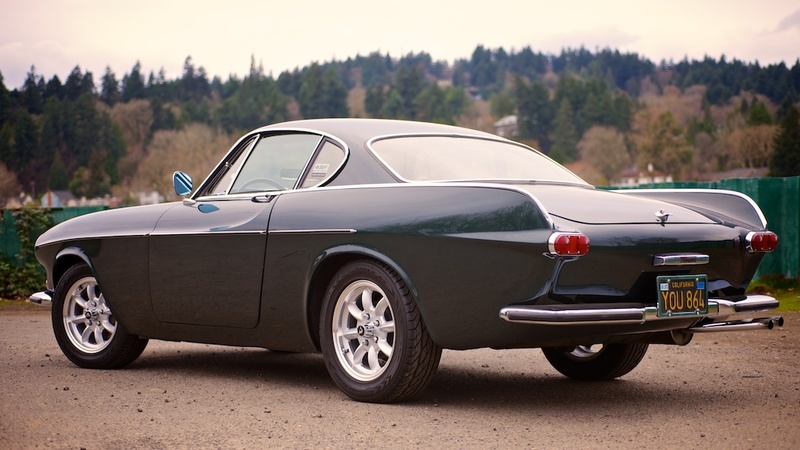 Quality paint job that can replicate the look of the original BRG would have been my choice for this car. 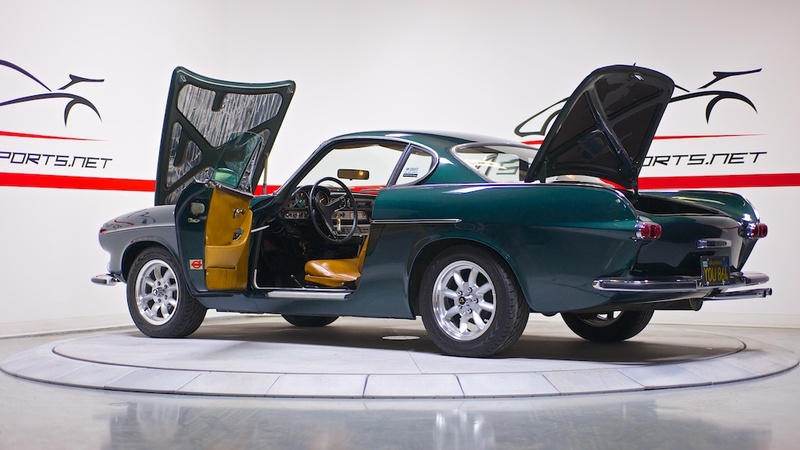 $17,500 - that is insane money for an 1800...did this car get listed on that other website...you know... Bring Assholes in Tweed? Nice car but to many things that arent my style.metallic paint,steering wheel is wrong,should have a 2 spoke.Engine looks great though. What an ugly little turd of a car. Drop in a Merlin big block, slam it and tub it, and you've got yourself a winner!